I Did Not Invent Halo 3! I-Bond Real Rates Triple In November! Alert for Tanks, John P. Hussman, Ph.D. The Fund made a very distinct move away from TIPS on the strength of recent weeks, as real yields on many issues moved to negative levels. As usual, we tend to be opportunistic in establishing investment positions, so to the extent that we observe decided weakness in foreign currencies, precious metals or TIPS (all of which would most probably be driven by a shift toward risk-aversion in response to fresh credit concerns), I would expect that we would re-establish exposure in these areas. I draw some comfort that I am in the same boat that he is in. If history is any indicator, it might be an actual lifeboat. You are probably wondering what the video has to do with China's real estate. Wonder no more! WOULD you buy a piece of property because of 100 bikini-clad babes? Update: I want to sneak in this bonus video from our friends at versusplus! Given the tame inflation outlook near term, Mr. Weinstein said he wouldn't own Treasury inflation-protected securities, or TIPS, due January and April 2011 because they don't provide much upside in prices. But long-term TIPS provide attractive value, especially in the 20-year sector, he said. Mr. Weinstein said there is a dichotomy between inflation expectations, which have been rising this year, and data that show little inflation pressure. For what it is worth, that's what I've been saying. The real yield on the 5-Year TIPS is just 0.25% (over CPI) right now. 0% is the floor. There is almost no upside left even if inflation becomes a persistent problem. At best you have an investment that tracks inflation that you also have to pay tax on. Further, there is plenty of downside risk if deflation hits again. Plenty. 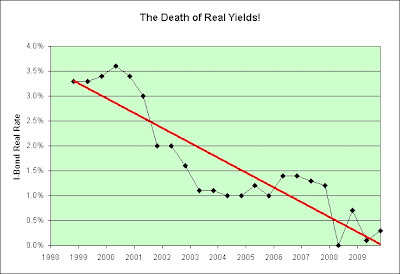 The last time deflation struck with a vengeance the real yield on the 5-Year rose to over 4% as people scurried to bury cash in their backyards. It was the day just before Thanksgiving of last year. I'm not counting on that day being special though. I'm simply saying that I don't think short-term TIP bond fund investors of today fully realize the risks involved. Inflation expectations drove the price of my TIP fund higher. I'm not paid interest based on inflation expectations though. I'm paid on based on actual inflation. If the market is wrong about inflation rising in the near term, watch out below. My last big purchase was the 20-Year TIPS several years ago. I thought the economy would be very slow to recover at best. For a while it was underwater, but it isn't any longer. Investors today can now buy it for the same price I did. It pays 1.8% right now. I think it is clearly the better bargain for long-term semi-bearish and/or cautious investors, at least when compared to 5-Year TIPS held to maturity and potentially reinvested three times. It's just an opinion though. Time will tell. I think I know how the rumor got started though. You MUST see #35. Candy Mountain has always been a favorite of this blog! It's been a LONG time since I've done a trade. I also still own TIP in my IRA. I'm letting that ride. It is in a dividend reinvestment plan and I see no point in actively trading something I won't be touching for 25+ years. I also own TIPS directly through the government. No intention of selling those either. I intend to put some of this money back to work in January's 10-Year TIPS auction, especially if we have yet another deflationary Christmas and inflation fears therefore recede. 1. I recently posted that I was deflationary in the short-term. I probably should put at least some of my money where my mouth is. Otherwise I am just a hypocrite. Most of my investment assets are still in TIPS and I-Bonds though. 2. This money is considered both emergency money and money I use to live off in the short term. No matter what, I'd need to sell some of TIP just to eat. Some of this money will therefore be used to replenish my online savings account. This price seems a more than adequate price to sell at. Buy low, sell high. Right? 3. This is not a bad year to be paying some taxes on the gains. Tax rates are still low. Interest payments have been rather low this year. The tax burden should therefore be relatively light. 4. 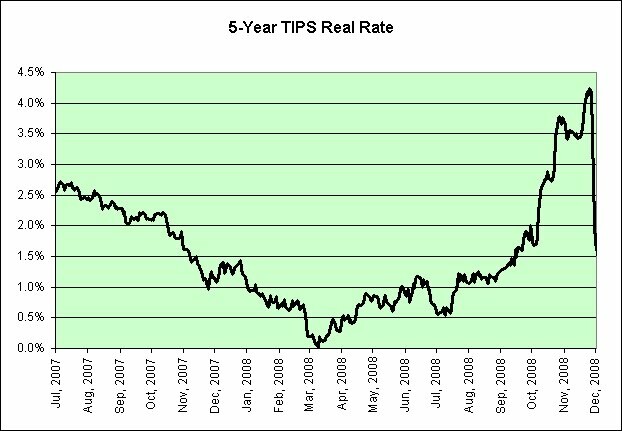 The 5-Year TIPS is paying just 0.35% over inflation. The 10-Year TIPS is paying 1.17% over inflation. 0% is the lowest they can go. My opportunity cost risks are therefore relatively minimal. 5. The 5-Year TIPS rate did fall to 0.01% on 03/10/2008. That was not exactly the buying opportunity of the century though. Way too many investors feared inflation. On 11/26/2008, just 8 months later, the rate actually hit a mind boggling 4.24%. A funny little thing called deflation struck with a vengeance out of nowhere. 6. Inflationary Christmas or deflationary Christmas? I lean towards the latter. 7. Oil seems to really be struggling to push past $80 a barrel, even as the dollar tanks. If it can't go higher, wage pressures are certainly not going to drive inflation higher. I'm also a believer that if it took $140 oil prices to crush the economy last time, it won't take nearly that much this time. $100 ought to do it for sure. The psychology of that alone would be devastating in my opinion, not just to us but China as well (which I am also very bearish on, unlike most these days). 8. There's a sign on an apartment complex near where I live. It says, "Pay on time, $50 off." Rent is a major component of the CPI. We've seen housing prices fall. We see the government push renters into becoming homeowners. So what does that imply might happen to rental prices? 9. I have a nearly overwhelming belief that most believe that the inflation trade is a "sure thing" that simply cannot lose money. I would have thought that myself in the very early 1980s. I would have been so sure of it that I would have no doubt lost my entire nest egg over the next 20 years. That was the worst possible time to embrace inflation. 10. Parabolas. They are everywhere these days and they ALWAYS scare the heck out of me. There is one question I always ask myself when I go to sell an investment. Would I buy today at these prices? If the answer is no, then I will hold. That's not a good enough reason for me to sell. If the answer is hell no though, then I do sell. Right or wrong, this feels like hell no. 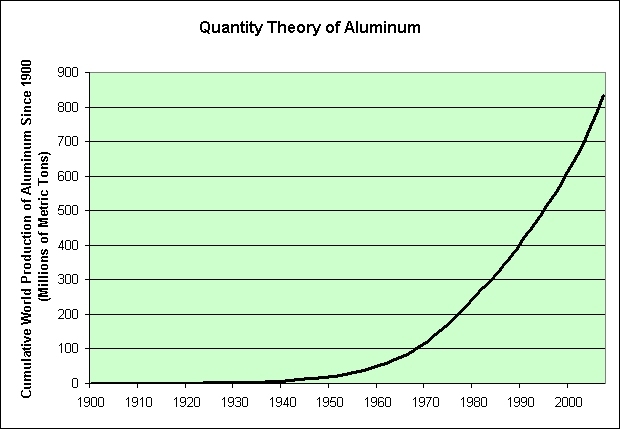 I just can't stand investing in parabolas. 11. And the straw that broke the back... mab pointing out that Sears just hit a 52-week high in the comments. Sold! I am still embracing inflation long-term. My investments still lean that way overall. I'm just not embracing it short-term any longer. I just don't see any reason to be "all in" on inflation right now. The poker table is just SO darned crowded. Now let's discuss situation #2. 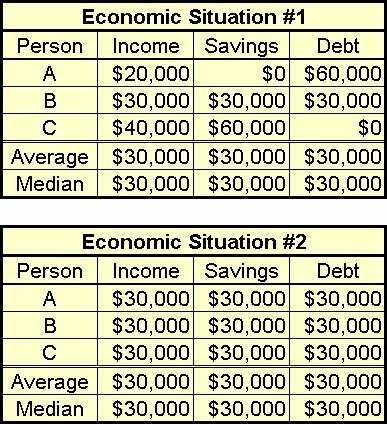 It might seem silly to you to see everyone in the economy have $30,000 in savings and $30,000 in debt. Why don't they just pay it off? I actually have a short story based on this premise. My memory is a bit fuzzy as it has been 30+ years, but I will share it the best I can. My dad was the bank manager in a small farming community. One day one of his customers (a farmer) came into the bank. He used his $250,000 in savings to pay off his $250,000 loan. In one day, my dad managed to lose $500,000 in business. Needless to say, the higher ups within the bank were not happy with my dad's performance that day. They thought he could have done a better job talking the person out of doing it. My dad saw it differently of course. There was no way he was going to try to talk someone out of doing a very rational thing. That brings me to another point. We clearly "need" more banks under situation #1 than we do under situation #2. That's what we are told anyway. We "need" lots and lots of banks. In fact, the more banks we have the more prosperous we become. That seems to be the thinking. I'm not exactly a believer, but then again I'm not exactly a mainstream economist. I have no economics degree. I tended to study things like gravitation in college instead. What goes up must come down. That sort of thing. The Federal Open Market Committee (FOMC) headed by Fed chairman Ben Bernanke likely will stay its highly accommodative course to help get credit, the lifeblood of the economy, flowing as the recovery progresses in fits and starts, analysts said. Heaven help us. I am a believer that there will be many, many fits and starts though. In fact, I'm starting to have a fit ("a sudden, acute attack or manifestation of a disease") just thinking about it. It was requested (by AllanF) that I do a regression analysis to estimate the formula used to generate I-Bond rates. This is my attempt. The four data points in the "Post-Crisis" box just happen to be the most recent four data points (starting on 5/1/2008). Go figure. As can be seen in the chart, there actually seems to be two formulas. One formula is used when there isn't a crisis. Picture moving that red trend line through the points in the blue box. The other formula is used once the crisis begins. Picture moving that red trend line through the points in the yellow box. As I am quite possibly the first to discover the secret secondary formula, I think I shall name it STS (Screw The Savers). Using a crude back of eyeball calculation, it looks like the STS can scrape about one full percentage point off of I-Bond yields once an economic crisis develops, all things being equal. All it takes is the wave of the pen by the government when it decides what I-Bond rates should be. 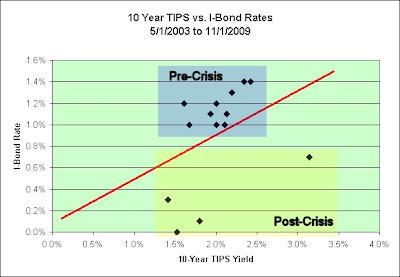 Fortunately, TIPS rates are mostly determined by the bond market. The government clearly doesn't have quite as much control over those. The four points in the yellow box also share one other trait. 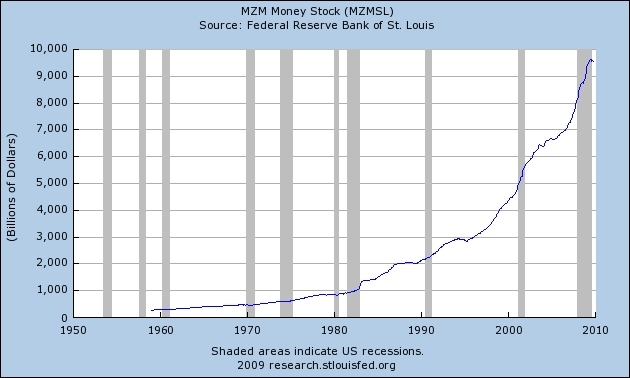 Once the crisis began, the government limited the amount of I-Bonds we can buy in a year from $30,000 to $5,000 (double that if bought in paper and electronic forms). Talk about overkill. TOILET paper, local and imported tea, diapers, bath soap, toothpaste, toothbrushes, cane knives and roofing sheets are among 24 new items that could soon come under price control regulations. With the wave of a hand, or the flash of a legislative pen, they promise to make everything cheaper. And for more than four thousand years the results have been exactly the same: shortages, sometimes of catastrophic consequence; deterioration of product quality; the proliferation of black markets on which prices are actually higher and bribery is rampant; destruction of a nation's productive capacity in the industries where prices are controlled; gross distortions of markets; the creation of oppressive and tyrannical price control bureaucracies; and a dangerous concentration of political power in the hands of the price controllers. When the first World War broke out, the German Reich immediately adopted a policy of inflation. 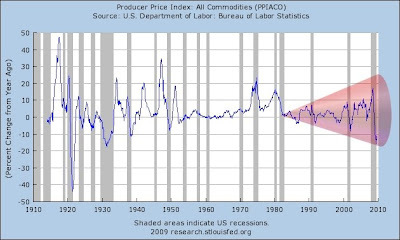 To prevent the inevitable outcome of inflation, a general rise in prices, it resorted simultaneously to price control. The much-glorified efficiency of the German police succeeded rather well in enforcing these price ceilings. There were no black markets. But the supply of the commodities subject to price control quickly fell. Prices did not rise. But the public was no longer in a position to purchase food, clothes and shoes. Rationing was a failure. This is not the deflationary Great Depression so far. That was an era when producer prices spent the majority of the time below the line. This is not the inflationary 1970s so far. That was an era when producer prices spend the majority of the time above the line. It's a bit of both! We certainly have the high unemployment common to both eras anyway. For long-term conservative investors/savers such as myself, it could be worse. Should the toggling continue, I can ride this out in relative safety in long-term TIPS and long-term I-Bonds (which is exactly what I've been doing). My investments will toggle in sympathy, but will still continue to outpace inflation (or at least keep up with inflation) over the long haul and that's all I really care about. This chart also explains why I am not seeing all that much toilet paper inflation since I turned bearish (much to the surprise of the hyperinflationists). It isn't that my toilet paper investment has been bad though. It's pretty much just tracking overall long-term inflation these days, which is just fine by me. In my opinion, this "cone of turbulence" is what happens when way too many heavily leveraged dollars slosh around looking to chase way too much global overcapacity using the power of the Internet, the power of instant real time trading tools, and the belief that the average individual investor can somehow be smarter than Goldman Sachs. It does feel empowering to have a computer on one's desk I guess, but to think my computer can compete with the computational power of a Goldman Sachs would truly be a delusion. The trading of these items is based purely on their price in relation to each other on a predetermined basis; and not on any fundamental analysis reason such as an individual company's earnings, dividends, or growth prospects; or, on any overall economic reasons such as interest rate movements, currency fluctuations, or governmental or political actions. According to the New York Stock Exchange, program trading accounts for about 30% and as high as 46.4% of the trading volume on that exchange every day. Every dollar that Goldman Sachs manages to extract from the system is one less dollar for the typical investor to make, all things being equal. I have no great desire to participate. The less I can trade, the better. That's right! They've gone from 0.1% to a whopping 0.3%! Just look at that massive spike in the chart. Wonderful! Who said I can't be optimistic when conditions warrant it? I've already bought I-Bonds this year when they were offered at 0.7% (using the rates as of November of 2008 and good for six months thereafter). It has been my hope that I-Bond rates would be at least somewhat tolerable by November of next year. So far, so good. I'm trying my hardest not to mention terms like "illusionary lipstick", "pig", and/or "dead cat bounce" though. There's just no need for that sort of negativity around here now that the economy has rebounded so robustly. I'm also trying not to mention that I-Bond rates have perhaps spiked unsustainably high and might be due for a massive correction. I mean really, tripling to a whopping 0.3%? The higher the rates go the farther they can fall. Right? I won't mention these things though, because that might get investors to think that the same thing might happen to riskier assets at some point. "Crash" and "mall traffic" are words I'm specifically not mentioning by name. Disclaimer: Commentary may have contained sarcasm. Past performance of I-Bond rates may not be indicative of future I-Bond rates. Illusionary lipstick, pigs, dead cat bouncing, crashes, and mall traffic mental images are offered simply as opinions and should not be construed as investment advice. At a conference, Roubini said that although easy monetary policies have fueled another asset bubble, the deflationary forces coming from industrial overcapacity, falling labor costs and a still damaged financial system will prevail over the next two years. I have listened to the arguments of commodity bull Jim Rogers and the counterarguments of Nouriel Roubini. I find Roubini's arguments much more compelling. That's especially true after looking at long-term cement prices in my last post. As such, I am changing my short-term inflation mood in the upper left hand corner of my blog to show my deflationary bias. That doesn't mean that I think oil can't make it to $100. Who knows? I don't think it will stay there if it does though, any more than it could stay at $140 the last time. It eventually all comes down to supply and demand. We built a supply side based on never ending debt-based demand. Now we're watching it all fall apart. As a side note, my girlfriend just bought a gallon of milk for 99 cents. How is that even possible? Dairy officials say this slight uptick in prices is not a long-term fix and they're still pushing for a change in the federal milk pricing system. You would think that an unsustainable global construction boom would have pushed cement prices near the top of their historical trading range heading into the bust. What could be more obvious? That was not the case though. Yet another "sure thing" investment crashed and burned. Go figure. I suspected there was serious overcapacity but I certainly didn't think there was THAT much. Wow. Today's GDP figures provided further evidence that in its efforts to avoid a slowdown, China has been stoking over-capacity. 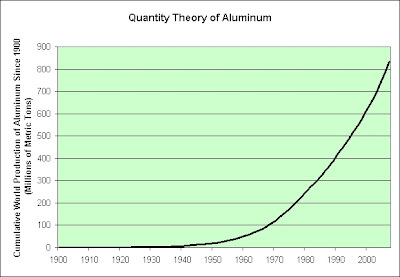 Even before the release, officials estimated that the peak output of steel was about 40 percent greater than expected demand. Purchases of cement, meanwhile, may absorb only two thirds of the industry's potential production. Despite this looming glut, China's state banks continued until recently to shovel record funds into heavy industry -- more than $1 trillion in the first six months of the year. The consequences of this investment binge will last well into next year. This blog has taken a more deflationary stance and continues to do so. Commodity investors beware, and that includes fiat commodity currencies as well, unless you think gold can rocket higher even if global prices fall. Again! Maybe it is different this time. That's pretty much the scariest sentence in all of investing though. Rarely does it work out in the average investor's favor. Gold investors of today are going to ban me at some point if I keep this up. It's just that I have a healthy skepticism of ANY investment once it reaches "sure thing" status. I was heckling dotcom stocks in 2000 when few were. I was heckling real estate in 2004 when few were. Although I owned gold from 2004 to 2006, I now find myself heckling it too. 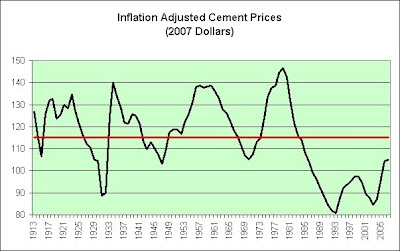 This article started with a curiosity over historical cement prices. I was not actively seeking to warn about gold again. I ended up there though. Go figure. I should also point out that I am aware of the risks. I very well could be wrong. 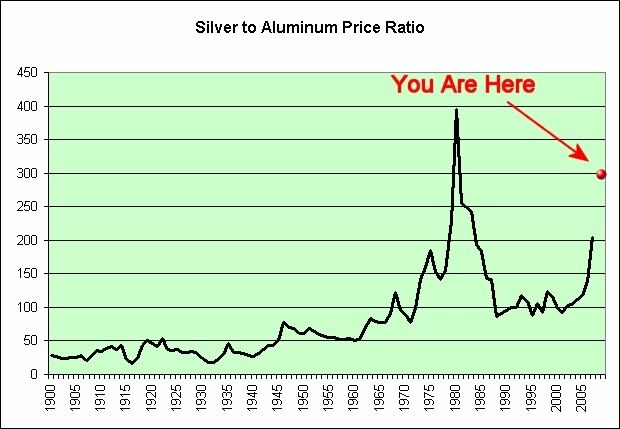 I'm staking my blog's reputation on a gold price bubble theory at a time when most would consider that insane. So be it. It all comes down to this. I honestly believe that toilet paper is the much better store of value if one must hoard these days and I'm sticking to it. Toilet paper has yet to go up in price much and yet it surely will if inflation takes off. Is it easy to hoard? No. Does it require a lot of work to transport it home? Yes. Is it easy to rationalize not hoarding it? Yes. It takes a lot of work to buy physical toilet paper at reasonable prices. I do not deny it. However, the market does not care about the work involved. It's either a bargain or it isn't. 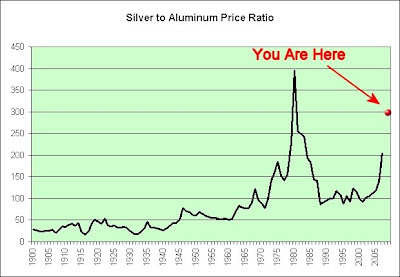 Relative to gold, I believe with 100% conviction that it is a serious bargain. In sharp contrast, well over a billion dollars worth of gold is now traded daily just through the physical gold (GLD) ETF alone. All it takes is a button click to participate. I wonder how much thought goes into the idea that gold is 1/4th of the bargain it was when it was four times as cheap though. At what point will most participants actually question its price? $2000? $5000? Or is it a great store of value at any price? Just how much cement do gold investors imagine they will be buying with it in the distant future? One last note. There's a lot of talk of India's government buying gold these days. From an emotional standpoint, this would seem to be a gold bug's dream come true. However, let's look back through history and see what it has to say. When was the best time to actually buy gold? Gordon Brown had decided to sell off more than half of the country’s centuries-old gold reserves and the chancellor was intending to announce his plan later that day. It was May 1999 and the gold price had stagnated for much of the decade. The traders present — including senior executives from at least two big investment banks — warned that Brown, who was not at the meeting, could barely have chosen a worse moment. The best time to be buying gold was when a major government was actually selling it. That's the conclusion of history. Only then could you know for sure that you were buying it cheap. And lastly, I'm really starting to see how Japan fell into a deflationary spiral and has yet to emerge. 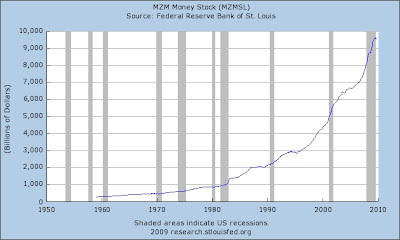 Nobody really believes that deflation can be sustained when there are government monetary printing presses that can print money at essentially no cost. Maybe they should. If cement can't even keep up with inflation during one of the biggest construction booms in the history of this planet, what does that tell you about the ongoing bust? It tells me that the deflationary forces are extremely powerful and should not be underestimated. The following two documents are a MUST read for those considering the purchase of TIPS. First, I want to sum up the ex-ante vs. ex-post thing. When looking ahead, inflation expectations imply that TIPS save the government money. That's the ex-ante part. However, when looking backward, inflation ran hotter than expected. That's the ex-post part. As an investor in TIPS, this condition serves me VERY well. In other words, the government did not expect me to make as much money off of TIPS as I have. I don't see this changing much as I look into the future. Second, I want to point out the stagflation sentence. I don't want anyone to miss it. The member noted that the "pro-cyclical benefits" argument for issuing TIPS also breaks down in stagflation environments. Should stagflation appear, the good deal that TIPS have been becomes even better relative to the debt the government could have offered me. The government gets a VERY rotten deal on inflating away the debt away if I'm sitting in inflation protected treasuries. Let's just put it that way. Economists conducting ex-post analyses have concluded that the TIPS program has been less cost-effective for Treasury than nominal securities. In contrast, other economists who have studied the issue argue that from an ex-ante (before the fact) basis, TIPS are not more costly to issue than nominal securities and that the relative cost of the TIPS program to date in part reflects start-up costs that will not be incurred again. Gotta love those "other economists" who love using predictions of future inflation instead of tried and tested actual inflation. What do you suppose the thinking is? Well, no need to wonder. They'll tell you. The time horizon of the analysis affects the results since, over the long run, the average amount by which actual inflation exceeds expected inflation will roughly equal the average amount when the opposite is true. Tell that to Zimbabwe, the Weimar Republic of Germany, or the Roman Empire. Surely there must be something in the document to support my wild accusations of future financial instability. Let's see. Maybe a chart would do it. I should die of old age right on schedule. Those expecting immediate short-term financial apocalypse will no doubt be sorely disappointed. This can drag on for decades. Rome did not fall in a day. My burden will not be placed on my grandchildren though. Like many forward-looking Japanese peering into the never ending pile of government debt, I have chosen not to have any children. Should other people become as financially defensive as I am, then demographics will be a future source of financial instability. Are Western Governments Going Broke? 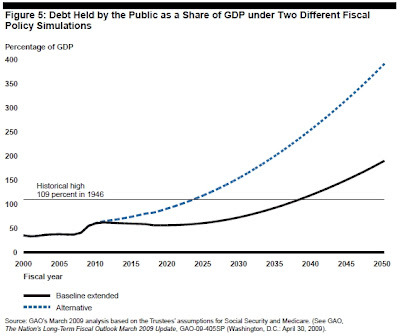 The underlying problem which deficit spending does not solve is compounded by demographics. Japan’s government is hoping that continued borrowing can be financed at low rates by pensioners who will be cashing out of their pensions but seeking safety. However, we suspect that Japanese pensioners will begin to consume their savings as they downsize their lives into their twilight years (which tend to last much longer in Japan, as the number of Japanese centenarians shows). That means interest on Japanese bonds-which already one fifth of the Japanese budget-will consume even more of the nation’s resources, if the older population clams up with its money. And like in the U.S., you’ll see the government borrowing more and more of every new yen spent, with more of that borrowed yen going to pay a previous creditor. That’s bordering on Ponzidom. So why would I pick stagflation over Japan's deflation long-term? Japan exports physical goods to us. We export paper dollars to them. We will always want Japanese goods in exchange for our freshly printed dollars. I think that pretty much goes without saying. However, what would happen if Japan started losing their interest in our paper dollars? Then what? Gold is going to suffer a serious correction in dollar terms. Greater than the one that occurred last fall, as this positive sentiment must be wound out. Dare I call these new highs in gold "malinvestment" as I would real estate? I certainly will, though even I cringe as I type the word. Malinvestment has to do with expectation and intent - those buying gold now have the same expectations of gold they did of real estate in 2006, that it will continue to go up. The US dollar is possibly the most hated piece of paper in investor terms on earth today (leaving aside notable exceptions such as Zimbabwe's dollar et al hyperinflationist currencies). Gold is the most loved metal. That is why we fly the contrarian flag today. The deflationist flag. Clearly this guy doesn't like gold. Right? Au contraire! But we will be watching our dear metals. I am no gold-bull, but a gold-bug. And when gold really IS the best store of value you can bet the farm that I will be a buyer. Today, though, it is not - too many speculators have sucked the value out of it. Once they are gone my bull-flag will be back up, and up long-term. I'm a long-term stagflationist but there are just WAY too many people on the precious metal band wagon these days. I've said this time and time again. The price of toilet paper is NOT confirming the price of gold's exponential move higher, any more than the price of toilet paper confirmed the price of real estate's exponential move higher. That said, the higher the price of gold goes, the more I want to own toilet paper. Why is toilet paper so much safer? It has not quadrupled in price in the last decade. There is no long line of speculators betting on its never ending rise. There is no ETF allowing heavily leveraged bets on its future price. If there's one thing that this new economy should have taught all investors, it is that heavily leveraged bets are things that must be avoided in order to protect one's nest egg. That is especially true once an investment reaches the "sure thing" level. Deep down, gold bugs know this is true. True gold bugs simply want to own the metal itself and tuck it away for the future. They don't borrow money to buy it. They don't try to leverage up their bets to eek out exponentially higher returns. I very much admire that long-term thinking and this makes what I write especially difficult. In fact, if I thought the market consisted only of gold bugs, I'd still own it even at these prices. Seriously. Toilet paper bugs and gold bugs are two peas in a pod. There is one key difference though. The only people investing in physical toilet paper are toilet paper bugs. I'm one and financially speaking, I'm very lonely in the investment. The lonelier I am, the safer I feel. My best investments were always made in isolation. That's how it has always been for me. I can still remember what it was like buying gold for the first time in 2004. I was not at all confident that I was doing the right thing. It was a very lonely feeling. The place I bought it from actually tried to talk me out of it. Gold was at the upper end of the trading channel and most felt it was due for a correction. I bought anyway. I believed in the long-term story. Gold bugs these days are not lonely though. They are sharing their investment with waves of momentum traders. I have absolutely no desire to join them at these prices. And lastly, from what I see there seems to be three main types of commercials on late night TV these days. This should be a wake-up call. No-money-down real estate is still coming in at #4, for what that is worth. With oil rising like it has it certainly isn't hard to imagine oil investors making out like bandits. Take the investors who bet on the price of oil directly, thereby cutting out the risk of owning individual oil companies. Let's see how they have done so far. The investment seeks to reflect the performance, less expenses, of the spot price of West Texas Intermediate (WTI) light, sweet crude oil. And why is that not a good thing? Options and future contracts are examples of zero-sum games (excluding costs). For every person who gains on a contract, there is a counter-party who loses. Gambling is also an example of a zero-sum game. Zero-sum games are not known for their ability to keep up with inflation long-term. Unlike investing in general, for each winner in derivatives there MUST also be a loser. There is no rising inflationary tide that can lift all boats. That said, USO investors managed to go that extra mile. They actually managed to lose a lot of money betting on the rising tide of oil and being right. Apparently the "losers" on the other side of the trade wanted to be paid a hefty premium to take the losing bet. Similarly, betting on the favorite ("sure thing") at the horse track each and every day of your life isn't going to improve your odds of keeping up with inflation either. Go figure. Is it any wonder why I hoard toilet paper? It's not a zero-sum game, I'll tell you that much. In theory, all toilet paper prices can rise together. We can all be winners if and when inflation really does pick up. Hurray! WisdomTree Trust has registered with the SEC a new exchange-traded fund that seeks to give investors long-term returns above the rate of inflation. To do so, the WisdomTree Real Return Fund (NYSEArca: RRF) will invest in inflation-linked securities such as U.S. Treasury Inflation Protected Securities (TIPS), bonds and commodities instruments. RRF will be the newest member in an expanding group of ETFs that seeks to capitalize on investors' rising fears of inflation. For some strange reason, the contrarian in me is half tempted to start learning Japanese and take some profits in U.S. Treasury Inflation Protected Securities. I wonder if it has something to do with WisdomTree launching their stock market ETFs shortly before the stock market imploded? And now they want to do the exact same thing with commodities? Call me skeptical of the wisdom. The commodity-producing nations will be the hardest hit when the current rally ends, Sharma said. The Latin American markets of Brazil and Chile are the most expensive, he said, and Morgan Stanley is also “underweight” on Taiwan, Malaysia, Israel and Russia. Commodity prices are rising even as economic fundamentals are deteriorating, he added, a sign that the rally may be fizzling. Inventories of oil, copper, aluminum have risen over the past few months even though demand hasn’t picked up, Sharma said, adding that the price of oil is inversely correlated to the U.S. dollar. Increasing buying of commodities as a hedge against the decline in the U.S. dollar has resulted in the commodity rally, he said. I am sympathetic to his deflationary arguments. Let's just put it that way. I was at Costco this week and noticed that the price of garbage bags has gone up. It's almost like garbage bags are made of oil. Go figure. Garbage bags were purchased at $9.99 + 8.9% sales tax = $10.88. Garbage bags now cost $10.79 + 9.5% sales tax = $11.82. I feel SO much richer now that Costco has raised its prices on garbage bags AND sales taxes have gone up. Win win! You can't see it in the picture but there are actually 12 boxes there. That's a capital gain of $11.28 that I will never have to pay taxes on. Compared to the current 0.05% yield on 3-Month Treasury Bills, isn't hoarding wonderful? That said, it's been a while (at least 2 years if memory serves) since I've seen an increase in garbage bag prices. I do not consider it to be part of an alarming trend. Overall, the prices of the items in the picture are fairly stable. Let's reserve "alarming trend" for if and when I'm circling the whole picture each and every month. 7. Replace your plastic garbage bags with biodegradable cornstarch-based bags, like those made by BioBag Garden. They are available at Whole Foods, or you can order them online from stores like Gaiam. I seem to have found an 11th option. While it may not be the "green" way to do things, it is certainly the far cheaper way. 11. Hoarding plastic garbage bags in bulk now will also reduce my petroleum dependence. I'll simply have less need to buy garbage bags in the future. The government is walking a fine line these days. They want us to spend money but they don't want us using it to hoard goods. As seen in the picture above, their efforts have been pretty much a failure with me. As I left Costco, I was told that I certainly made good use of the coupons. I laughed and said that I was preparing for the apocalypse. He said he understood. I turned a bit serious and said I was only half-joking. He said he wasn't joking at all. I followed up by saying that the economy was really struggling and he nodded in agreement. I'm reminded that all of the people cannot be fooled all of the time. Guys-I have been stripping two dividends a month using PHB-HYG-JNK for about a year now. It has worked for about 10 months with the X-dates set right for this method of income. I have done this for years with utilities common but the ETF's with the large dividend has been working better. Please be careful and have patience, and set some limits too remember a 40 cent divi can not off-set a 90 cent cap loss. Just hold for the next dividend and don't worry about only one dividend in 30 days. Even successful 4 months a year with JNK and PHB will increase your return to about 20%. Now that is an interesting concept. I do just the opposite. I trade between PHK, and JNK for the capital gain, and seldom get a dividend in either one, unless trapped into it. I buy after the dividend, and sell just before the dividend. to get the cap gain. for instance, I sold my PHK just before divvy of .12 this month at 10.49, and the rebought it at $10.20 for a net gain of .29. Of course I lost the $.12 divvy so netted out at $.17 on each share after subtracting the divvy, and commission of $13.00 each way. Since I do this in my ROTH, no taxes no bookeeping. Two methods of working the divvy date, as long as both work that is great. If that isn't proof that bull markets make geniuses out of everyone, I don't know what is. One guy day trades for the dividends and avoids capital gains like the plague. The other guy day trades for the capital gains and avoids dividends like the plague. It will be curious to see how their two "gambling" systems work if and when junk funds start going back down again. The first guy plans to ride it on down ("just hold for the next dividend") and the second guy will be paying "$13 each way" to concentrate on pure capital losses. Neither seem to grasp the concept that passive buy and hold investors were up 31% YTD on JNK (and will also lose big if the junk funds head back on down of course). Meanwhile, here I sit quite comfortably in... garbage bags, lol.